Toss bell peppers, squash, and zucchini with oil, salt and pepper. Place on baking sheet. Bake uncovered for 10 minutes. Flip vegetables and continue to cook for another 10-12 minutes until vegetables are roasted and tender. In the meantime, place pizza crust on ungreased baking tray. Spread pizza sauce evenly on crust and top with shredded cheese. Once the vegetables have been turned, place the pizza in the oven, alongside the vegetables. Allow to cook for the remaining 10-12 minutes until both the vegetables and pizza are cooked thoroughly. 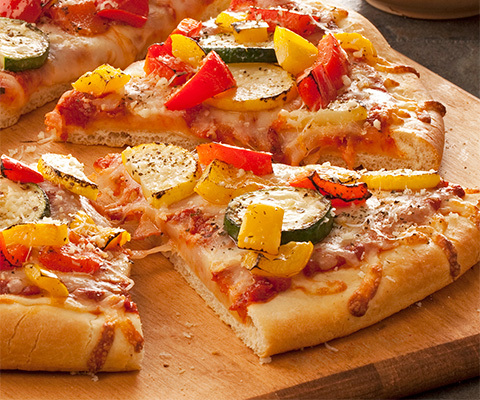 Using tongs, top pizza with roasted vegetables. Sprinkle on parmesan cheese and dried basil.